Outlook PST Recovery is an eminent solution for recovering and restoring corrupted Outlook data files (.pst). Download free PST rebuild tool to reads and repair damaged PST file and to recover deleted data from it. It restores information into a healthy PST file. Recovers the permanently deleted emails, calendars, tasks, notes, etc. Outlook PST Repair Tool is a competent application incorporated with an effective technology to repair the corruption issues at once and provide an absolute recovery of Outlook emails from PST file in MSG/EML/PST formats. 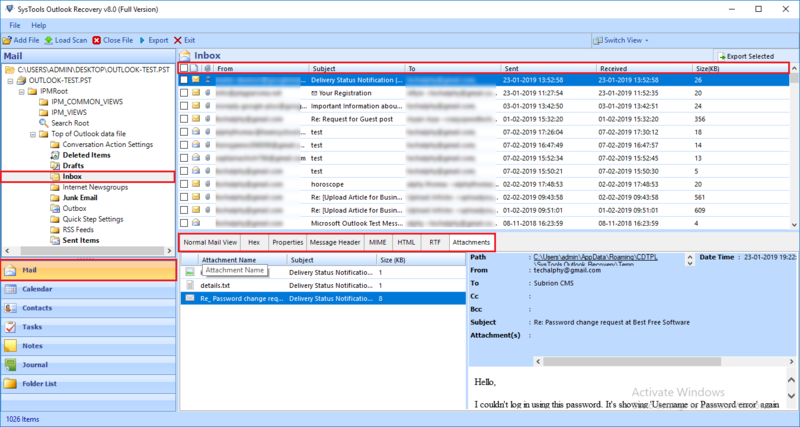 In order to recover Outlook file, browse the corrupted or damaged PST in the software and initiate the scanning program. By default, this Outlook PST file repair tool has developed to scan and fix minor level of corruption, but to deal with high level of corruption in Outlook Data file a user can switch to Advance Scan Mode. It's help in recovering deleted items of PST files. By using this application, a user can recover Outlook items, even the permanently deleted data items (hard deleted items) in three different email client formats such as PST, EML and MSG. The efficient algorithms associated with the PST recovery tool enables all the emails, contacts, tasks, calendars, notes, etc. to be recovered accurately with the tool without any difficulty. Often the PST files get corrupted due to their large size. The utility provides an option to divide PST files into a number of smaller PST files and create PST of same sizes by selecting the size from the range 1 GB to 45 GB. Thus, the user can easily manage small sized PST files. It is a proficient solution, if you are encountering corruption issues due to oversized PST file. Select a particular date range & filter out the emails accordingly with in that date range to recover Outlook emails. You can select date range by setting "To" & "From" details. Thus, it saves both time and unnecessary effort which the user would have applied to export all the items rather than selective export. Filtering option keeps the size of PST file smaller by avoiding older emails. Seven naming conventions for emails saved in EML and MSG file format is provided by Outlook PST Recovery Tool. This helps to sort the messages by name, sender, and subject. Also, this feature has been aim-fully embedded in the tool to provide users a well-managed output for number of emails. This feature helps Outlook users to manage the recovered Outlook emails in an efficient manner. Outlook PST Repair Tool maintains the original formatting of all the data items including calendars, emails and contacts even after the recovery process. It also keeps the meta data properties of the emails like from, to, Cc, subjects, attachments and other details unchanged. Means, you do not need to worry about the structure of emails which has been recently repaired. PST Rebuild Tool provides an option of instant preview of all the emails and their corresponding attachments. In addition to restoring Outlook File & items, the user gets to see the preview of all other data items like Calendars, Contacts, Notes, tasks etc. On the preview pane, there is an option to select items for export too. Simply, choose an email to get its preview (Normal Mail View, Hex, Message Header, MIME, HTML, RTF & Attachments). 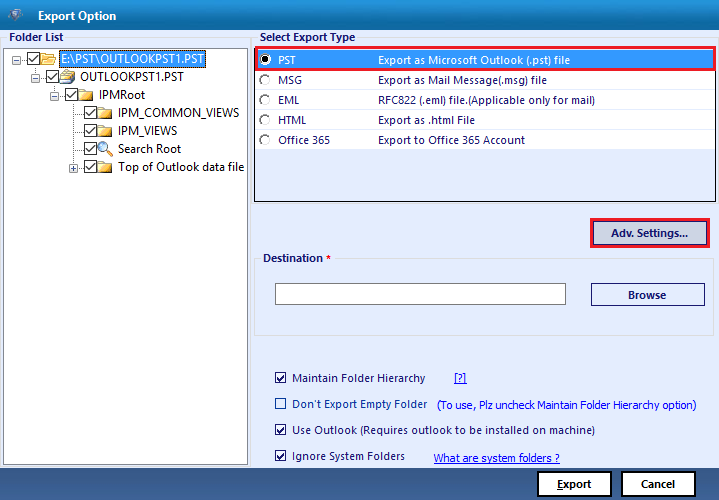 The user will get an export report generated by the Outlook PST recovery application at the end of complete execution. On successful completion of recovery process, the software generates a detailed report mentioning the location of the mailbox selected for recovery, success rate, failure rate and the exported file. One can save the report as a CSV file and refer it in future. Capable to scan and recover both types of PST files; ANSI & UNICODE. Option to check or uncheck the folders which you want to export. Windows OS 2000, 2003, 2008, Xp, Vista, 7, 8, 8.1, 10 (32-bit & 64-bit). 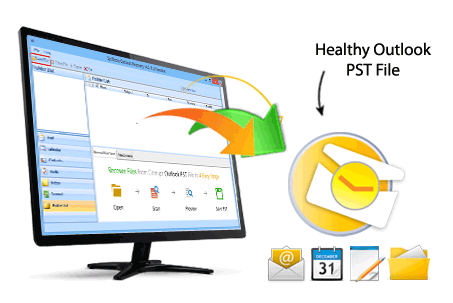 PST Recovery utility provides all the details of items within a small time. Provides an overview of Outlook email attachments in preview. There is no limitation on the size of the Outlook data file recovery. MS-Outlook 2000, 2003, 2007, 2010, 2013 and 2016. Outlook Recovery demo version can recover 25 items from each folder. Download Free Outlook PST Recovery Software to recover all MS Outlook components like emails, contacts, calendar, notes, tasks and etc. You will export only 25 items per folder with the help of demo edition tool. The PST files on my system suddenly became inaccessible. I tried to fix the problem with Scanpst.exe tool but it couldn't repair the files successfully. Then I came across Outlook PST Repair Tool. With this solution, I was able to access all the corrupted PST files. I am really thankful to you for developing such a competent solution to ease out my problems. Recovering the permanently deleted items with Outlook PST Recovery software is an added benefit that I got with investment in this solution. I was afraid that the large size of PST files would again make the PST files corrupted but during recovery process, splitting option proved to be very helpful solution as it works with the clear-cut precision. How can I recover Outlook PST files items and restore them in PST format? Steps to repair and recover Outlook PST file data items. Add PST file/s to the application to recover deleted items. Can I decrypt encrypted Outlook emails using this PST Repair tool? Yes, this software can remove SMIME and OpenPGP encryption from Outlook email messages, provided with proper certificate, private keys and password. Will this application recover email attachments from Outlook PST file? Yes, the Outlook PST Recovery tool can recover all PST file items like email along attachments, contacts, calendars, tasks, notes, journals etc. effortlessly. It preview retrieved email attachments in the preview panel. Can PST Recovery free version repair damage Outlook data file? 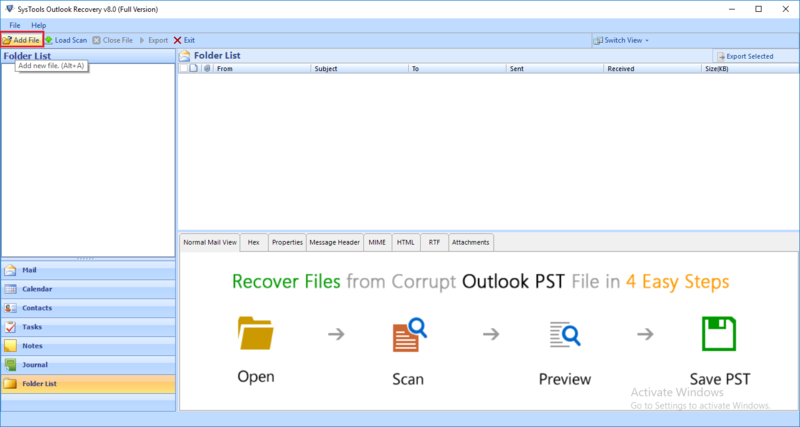 Yes, the trail version of this Outlook Repair tool can repair corrupted PST files and retrieve permanently deleted Outlook file items. But this demo edition can only export 25 items per folder in selected file format. Does PST Repair tool has any file size limitation on PST file? No, the software does not impose any file size restriction on Outlook data files (personal folder). You can repair and recover Outlook data files with any size, and application provide split option to break large PST file into smaller one while exporting in PST format. Will it support PST data file from MS Outlook 2003 version?